Thomas DeWolf-a descendent of slaveholders-and Sharon Morgan-a descendent of slaves-come together to openly discuss how the legacy of slavery and racism has impacted their lives. Together, they disclose the various difficulties and rewards they experience as individuals striving to heal. 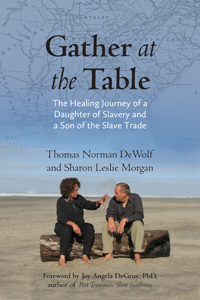 Gather at the Table is a timely, candid, and deeply relevant book that offers an engaging model of restorative justice.